Click on the brochures or product spotlight below to download the PDF. Soluciones para Transportador Vertical Ryson. Download the Ryson Spiral RFQ form here. Click to download PDF Unit Load Spiral – Ryson Spiral Conveyors need less floor space than conventional conveyors and are faster and more reliable than any elevator or lift. The spiral conveyor diameter is determined by the size of the loads (length, width and height) to be handled. A broad range of sizes allows the Ryson Spiral Conveyors to be viable in the manufacturing, packaging, bottling, order picking, distribution, and warehousing operations of most industries. Read more about Ryson Case Spirals in our Blog. Click to download PDF High Capacity Spiral – “A Spiral for the Tough Jobs.” The new Ryson High Capacity Spirals are in response to our customers need to go higher and handle more weight. The high capacity spiral can handle double the capacity of our regular spirals. they ship in one piece which drastically reduce the time and cost of installation. They are ideally suited for warehousing and order picking operations, and can optionally be configured to allow loads to enter or exit at intermediate elevations. Click to download PDF Wide Trak Spiral – These spirals can handle a variety of load sizes, big and small with their 30′ wide slats. The Wide Trak Spirals can handle double the weight capacity of our standard spirals, and can provide an elevation change of up to 50 feet with only one drive. They are ideal for warehousing and order picking operations. 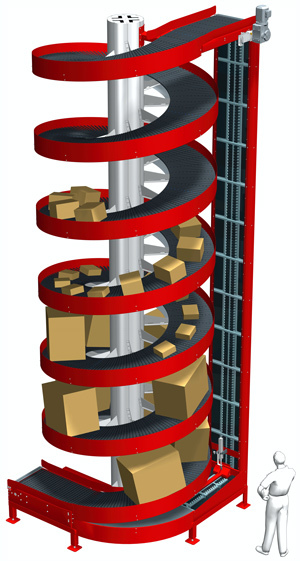 Click to download PDF Multiple Entry Spirals – “A Solution for Multi-Tiered Product Flow” Multiple Entry and Exit Spirals allow loads to enter or exit the High Capacity Spirals at intermediate elevations. New special induction and divert conveyors have individually adjustable conveying surfaces to match the spiral pitch, assuring a smooth and reliable operation. They work best when loads are fairly uniform in size and weight. Click to download PDF Mass Flow Spirals – The Ryson Mass Flow Spirals are designed to handle full and empty bottles, cans, jars and other similar containers. The Ryson Mass Flow Spirals are ideal for canning and bottling operations where units need to be conveyed vertically in mass. Products are conveyed up or down in a continuous mass flow. Ryson Spirals have a small footprint and provide considerable space savings compared to conventional methods. Click to see examples of Mass Flow applications on our weekly blog. Click to download PDF Narrow Trak Spirals – The spiral conveyors are equipped with our new 6” or 9” wide nesting slats which provide an efficient flat conveying surface without gaps. The nesting slats have the capacity to reliably end-transfer small cartons and packages or side-transfer small bottles or containers in a single file or in a continuous mass flow. The Ryson Narrow Trak Spirals are great space savers with high throughput that can run at speeds in excess of 200 fpm. The Narrow Trak Spirals are especially beneficial for the food, beverage, pharmaceutical, nutraceutical and personal care market. Click to download PDF Dual Track Spiral – The new Ryson Dual Track Spiral Conveyors are the ultimate in space savings. Two tracks operate independently within one spiral structure. Both tracks can go up or down, and can optionally be reversible. Only one drive motor is required for each track, resulting in substantial savings in energy, controls and systems integration. See some examples of the Ryson Dual Track Spiral. Click to download PDF Vertical Accumulation Buffers – Overhead space is efficiently used for overhead dynamic storage or buffering while preserving valuable floor space. The Ryson Vertical Accumulation Buffers utilize one reversible spiral or combine two or more spirals for up and down movement. Most conveyable products can be handled, including bottles, cans, pails, bags, bundles, totes, containers and wrapped or unwrapped items. Click to download PDF Bucket Elevators – The bucket elevators combine vertical and horizontal transportation of bulk material in one integral unit. These enclosed pivoting bucket systems can have multiple in and outlets. Their modular design and rugged construction make them suitable for a wide variety of applications.For more details on the Ryson Vertical Conveyors, please visit our Ryson YouTube Channel, or read current news and installation stories about the Bucket Elevator on the Ryson Blog.